"I Love You, You Idiot"
Seven years after Gilmore Girls ended, I finally get my guy's perspective on this caffeine-addicted two-some and their Twin Peak-esque town of Stars Hallow. The various face one Jeremiah Lews may make during a viewing of Gilmore Girls. I convinced my husband, Jeremiah, to watch Gilmore Girls. I must note, previous binges over the years have included Veronica Mars, Buffy AND Angel, That 70s Show, etc - apparently I am pretty good and convincing him to relive my teen/college television tastes with me. 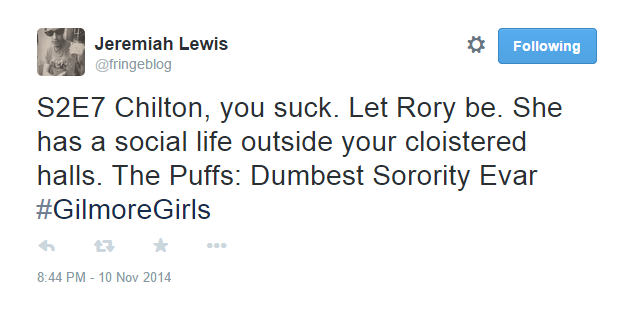 We started Gilmore Girls at the begining of November and Jeremiah has been tweeting his reponses to each episode. He did get behind on his tweets (no fear - he writes down his reaction after every episode), but is close to catching up. My fellow Gilmore Girl fan friends love reading his 144 character recaps and I thought you might enjoy them too. Also - shout out to Netflix (you remember my excitement when they announced it would be steaming, right? ), without which this enjoyment would not be possible. Here are a few from Season 1- 3. I tried to pick out the ones that are minor Spoilers or more opinion based. Advance at your own peril (for those who still have not seen the show) Plus - check out his twitter feed for more - especially since we only have a few more seasons to go.